Kids love to pretend like they are adults, and playing with baby dolls is a big part of that. The Luvabella doll collection is an amazing advancement in how realistic play toys can be. 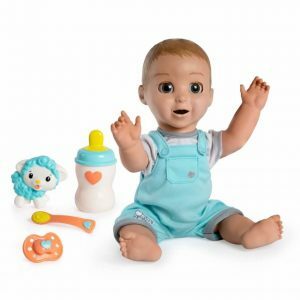 This incredible little doll is responsive in many ways, giving your youngster the opportunity to raise their little one. Children over the age of four can safely enjoy this cute little doll. Luvabella is available with different hair colors so you can choose which one you want, or add several to your household! The line is designed with your little ones in mind, which includes letting them teach baby just like they were taught. You can order blonde dolls, brunette dolls, and dark skin dolls. 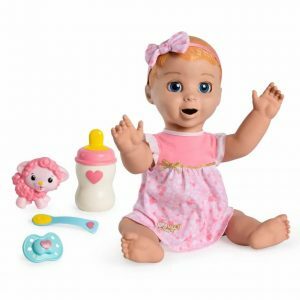 When the doll comes out of the package, her only talking is baby babble. However, your youngster is sure to delight as Luvabella begins to expand her vocabulary. The more you interact with her, the more quickly she will gain the ability to speak. By the time Luvabella has completed her vocabulary training, she will be able to speak over 100 words and phrases as your own kids marvel at how the doll has advanced. 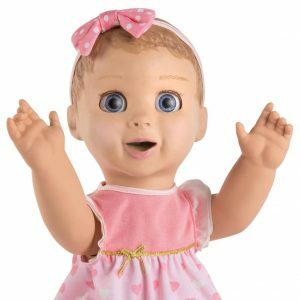 The doll also has incredibly realistic facial expressions and movements that mimic real babies. Her expressions will show her feelings, including happiness and sadness. She can also lift her arms to be picked up and look around the room. The adorable little doll comes with four different accessories designed to further enhance play with Luvabella. Among these is a spoon that can be used to feed the baby. She will chew her food hungrily, and might even ask for more. Once the toy baby is finished with a meal, your child can burp it! Buy the nursery set that includes a cute diaper bag if you want to add some fun toys for your child to play with. The baby has her own bottle that can be used at feeding time as well. Her pacifier, or soother, can help little Luvabella take a nice relaxing nap. The bottle accessory can also be used in order to help her quiet down. Once the sweet little toy baby has fallen asleep, you can place your ear against the doll and hear a realistic heartbeat. Of course, babies need more than food and naps to be happy. That is where the Lamby accessory comes in to play. This fun little toy will get Luvabella ready to play. When you hold Lamby to the doll’s face, she will make animal noises and give the toy a little kiss. With this toy, your youngster can begin to teach little Luvabella animal words. You can tickle the doll and make it giggle, just like a real baby. The doll comes with two pieces of clothing and a bow for her hair. Additionally, the four interactive accessories and complete instructions for how to get the most out of Luvabella are included in the package. You will need to purchase 4 C cell batteries to operate the doll. 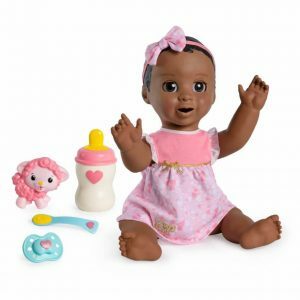 If you have a little one in your life who wants a fun baby doll, the Luvabella interactive doll is an excellent choice. With so many ways to play with her, your child will never get bored!